Mcdonald's always finds ways for Filipino's satisfaction and happiness in terms of food, which also our number weakness. 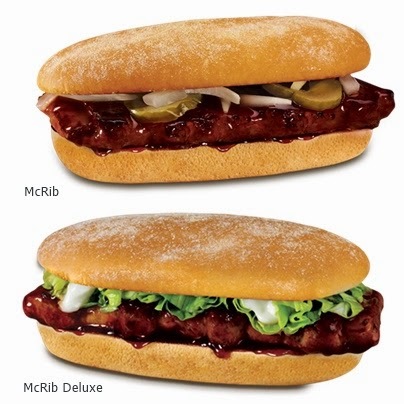 But ever since, McDonald's never fails to satisfy our cravings, specially with their newest offerings, the new McRib. McRib is a sweet, smoky and generous with sauce barbecue burger that comes with a juicy, rib-shaped pork patty dipped in sweet, tangy and smoky barbecue sauce, topped with pickle slices and slivered onions, sandwiched between two warm caramelized buns. A well-loved and highly-anticipated product in other countries, McRib is now made available for the first time in the Philippines for a limited time only to satisfy one’s barbecue cravings. “McDonald’s is excited to introduce the McRib sandwich in the Philippines. We remain committed to surprising and delighting our customers with a variety of delicious meals made with high-quality ingredients at great value. The McRib is all that and more – it is a delicious food experience one should enjoy while it lasts,” said McDonald’s Philippines Senior Vice President for Marketing Margot Torres. Me together with my co-bloggers, had a chance to try the new McRib and McRib Deluxe before it was available in the market and indeed, it satisfied our barbecue cravings in the most gradual way specially combined it with McDonald’s World Famous French Fries and drinks and your day will be completed. The McRib is available in all McDonald’s stores nationwide via Dine-In, Take-Out, Drive-Thru and McDelivery via the McDo App, 86-2-36, and mcdelivery.com.ph.